Fine litter granules can get tracked through the house. If you aren't careful, your cat's litter situation can get out of hand -- and that's a mess you don't want to deal with. Managing cat litter takes only a few minutes a day, and it keeps your home and your cat cleaner and a whole lot better smelling. Place litter boxes throughout your home. Ideally, you should have at least one for each cat, plus one more. Spread them out so there is at least one on each floor, and keep them in private areas -- you don't like an audience when you use the restroom, and neither does your kitty. Scoop out the box at least once a day, and toss the poo in a sealed or tied bag. Never flush it unless you use litter that is specially formulated for flushing -- otherwise, you're going to have much bigger problems than a stinky litter box. Dump the entire box once every week or two. Give it a good rinse and a scrub with mild detergent. If you have something fragrance-free, that's all the better. Scented litter can make your cat think twice about doing his business in it. While you're at it, scrub off the scoop, which can get crusty and gross if you don't wash it. Dry out the box with a utility towel, then refill it with 2 inches of clean, fresh litter. Use litter that suits your needs as well as your cat's. For example, clumping clay litters are easy to clean but can kick up a lot of irritating dust. Fine-grain litters get trapped in kitty paws and tracked throughout the house, while larger-grain litters are less likely to. Flushable litters save you a trip to the garbage can, but their clumping effectiveness varies. If you experiment with a new litter, introduce it gradually by mixing more and more in with the old litter over the course of a week or two. Kitty still leaving traces of litter all over the floor? Give it a sweep once a day or so, but only when he isn't around -- otherwise, he could start associating the big, scary vacuum with his litter box. Throw away and replace your litter box once a year. The scratches your cat leaves in the box can hold smell and bacteria. For extra odor fighting power, spread a thin layer of baking soda across the bottom of the litter box before you fill it. While plastic liners may seem like a time saver, cats dig in their litter and can shred the plastic with just a few claw swipes. This makes an even bigger mess than before. You may just save yourself some trouble and skip the liner. Don't be tempted to spray down the litter area with fragrant aerosol. While it masks the box odor, strong scents can repel your cat. 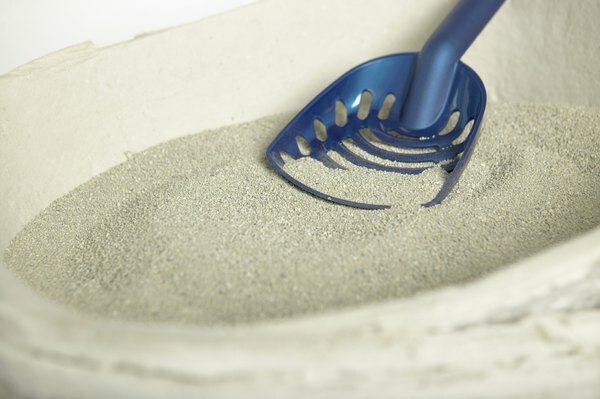 Petfinder: How Often Should I Clean My Cat's Litter Box? What Are the Ingredients in Scoop-Free Cat Litter? Why Has the Cat Started Wrecking the Cat Litter?